Tommy Orange, author of the novel “There There,” in conversation with Richard Wolinsky. Winner of the PEN/Hemingway Award, the National Book Critics Circle John Leonard Prize, and the Center for Fiction First Novel Prize. “There There” is set in and around Fruitvale and the Coliseum areas in Oakland, and looks at the lives of several Native Americans, young and old, as they converge for a giant pow-wow. The novel stretches back in time to the takeover of Alcatraz and forward to the present day, shattering stereotypes and delving into the real lives of the urban Native American. 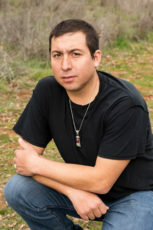 Tommy Orange was born and raised in Oakland, and is an enrolled member of the Cheyenne and Arapaho tribes of Oklahoma. An extended 33-minute version of this interview can be found as a Radio Wolinsky podcast.